Lent begins with Ash Wednesday on Feb. 13, and Archbishop Charles J. Chaput will be the principal celebrant for the Ash Wednesday Mass at 12:05 p.m. at the Cathedral Basilica of SS. Peter and Paul, Philadelphia. 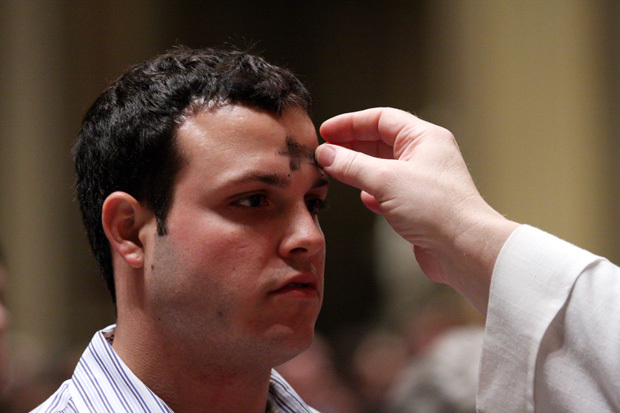 Catholics in 252 parishes across the Archdiocese of Philadelphia will attend Mass or a Liturgy of the Word that day and receive ashes on their foreheads, which are marked in the sign of a cross to remind them of their mortality and the need for God’s grace. Christians throughout the world will begin their observance of Lent, the 40-day penitential season of prayer, fasting and almsgiving from Ash Wednesday through Holy Thursday in preparation for Easter. This year Easter falls on Sunday, March 31. Beginning next week, parishes in the Archdiocese will offer the sacrament of penance and reconciliation each Wednesday evening from 7 to 8 p.m. for the duration of the Lenten season. The Bishops of the United States prescribe, as a minimal obligation, that all persons who are 14 years of age and older are required to abstain from eating meat on Ash Wednesday, all the Fridays of Lent and Good Friday. Further, all persons 18 years of age and older, up to and including their 59th birthday, are required to fast by limiting themselves to a single full meal on Ash Wednesday and on Good Friday, while the other two meals on those days are to be light.